Psoriatic arthritis treatment primarily centers around symptom control rather than cure. Basically there is no cure for either psoriasis or psoriatic arthritis, but there are effective treatments for both the skin and joints. Topical therapies are the first line of treatment for psoriatic skin disease. There are three basic categories of medication used when treating the joint pain and stiffness of psoriatic arthritis. These include non-steroidal anti-inflammatory drugs (NSAIDs), steroids, and disease-modifying anti-rheumatic drugs (DMARDs). NSAIDs include the old stand-by, aspirin (ASA) and other anti-inflammatory medications that have been used for a long time including ibuprofen (Motrin, Advil) and indomethacin. As with all medications, there are potential side-effects. Gastro-intestinal problems, including ulcers, may be a problem with long term use of NSAIDs. Disease-modifying anti-rheumatic drugs (DMARDs) include immunosuppressant medications that depress the immune system and hopefully depress the joint inflammation that it causes. Some common medications in this category include Imuran and methotrexate. Although we have used these medications for a long time and are therefore familiar with them, they can have potentially dangerous side effects. There is a lag period between beginning these medications and seeing their effects. Another category of DMARDs are the tissue necrosis factor (TNF) inhibitors. These are also known as “biologic” medications. This category includes Enbrel, Humira, and Remicade. These medications are expensive, must be injected, and can have potentially serious side effects. Certainly they require the careful attention of a physician who specializes in their use. Regarding psoriatic arthritis treatment, never forget your most powerful tool: yourself and your resourceful, healthy attitude. Being a healthy weight is imperative to prevent long term joint damage. Steroids are sometimes useful for short term control of joint inflammation, particularly while waiting for the delayed effects of other medications. Steroids are most useful when injected into the joints in cases of acute, severe pain and swelling. There are several different kinds of injectable "steroids" that can be used. The biggest difference in in duration of action; where one may last longer than others. 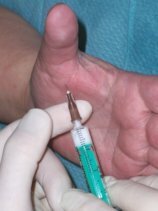 Care must be taken not to over-utilize steroid injections, as studies are now showing that cortisone, when used excessively, can cause additional damage to joint cartilage. In addition to traditional medical treatments for psoriasis, more and more individuals are realizing the significant benefit that home remedies provide as treatment options. Exercise, whenever possible and within reason, can prevent long term disability. You can always exercise in water. Judicious use of heat and cold, including hot water, can help. Rest, and pace yourself. And recognize depression and get help in treating it. Remember, this disease not only affects you but all of your friends and family too.